Almost half of all children have cavities by the time they enter kindergarten, but it doesn't have to be that way. Yes, sweets are a fact of childhood, even if they only eat fruit! But if children brush often and well they can get rid of many of the plaque-building culprits before they start to cause damage. Children have 20 primary teeth, all of which depart by the age of 12 or 13. This doesn't mean they aren't important though. Baby teeth can lead the way for the adult teeth children will need to live with for the rest of their lives. Not only are they place savers for later teeth, but decay and other problems with baby teeth are usually transferred to adult teeth. 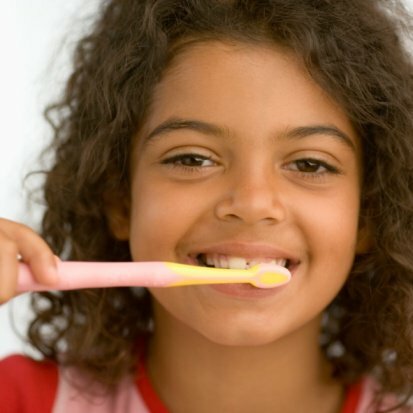 Children feel better with clean, healthy, pain-free teeth and gums just like adults do. Starting Off on the Right Tooth! Even before babies have teeth, parents can wipe baby gums with baking soda, essential oils, or grapefruit seed extract, which is filled with antimicrobial components. Fortunately, there is one toothpaste that already comes with these ingredients blended together: Tooth Fairy Fluoride Free toothpaste. As soon as the first tooth appears, you can teach a child to help you brush it, using a soft, small toothbrush with the toothpaste and water to remove debris and plaque. When your child is 2 or 3, she can learn to brush on her own, though it's a good idea to keep supervising until she reaches 6 to 8 years of age. Using circular motions, gently brush each tooth, 2-4 times in each area, front, underneath and back, at a 45 degree angle. Try doing it first and then having your child copy you. Standing behind her to brush while you both look in the mirror is one good strategy. Some dentists will recommend fluoride for young children, but others don't even use it themselves. Believe it or not, fluoride is actually controversial: It can be toxic in large quantities and it is not meant to be swallowed. There are other ways to keep teeth strong and healthy for years to come: Many people brush with coconut oil well beyond childhood. The biggest reason to avoid using fluoride for small children is that they do constantly swallow it. It tastes good, after all! Your child's mouth is the gateway to the rest of her body. Dental hygiene is linked with higher immunity and overall health throughout life. Doctors know now that good oral hygiene can help prevent heart disease, diabetes, strokes and many chronic health conditions. The mouth is the gateway to the inside of the body and the association has only been recently understood. It's never too early to take charge. The family who brushes together stays cavity free together. Make brushing a fun family activity that you do twice each day together and your child will not only develop good life-long habits but will also have positive feelings about the whole process. Visit Biconi for Tooth Fairy Fluoride Free Toothpaste today.